The new generation of movies are stereo images projected by two lenses. Each image of the pair is polarized so that if you wear polarized glasses each eye can see only one of the image pairs. Regular polarized sunglasses will not work because the angle of the lenses in the glasses must match the angle of the angle of the projected light in order to make this system work. Some IMAX movies are also polarized images. Standard IMAX movies are 2D projections from large films shot with a wide view panoramic camera. But some are stereographs and can be viewed with polarized glasses or with liquid crystal shutters that strobe rapidly in sync with the projection. The results are breathtaking stereo projections with incredible depth, breadth, and color, and usually accompanied by knock-your-socks-off digital stereo sound. Stereocards. Stereocards first appeared in the mid 1800s and are still a great experience. They are usually two pictures mounted side by side on a 3.5 x 7" inch card that create a remarkable feeling of depth and dimension. The best way to view stereocards is to use a "Holmes" viewer like the one developed by Oliver Wendell Holmes in 1859. Millions were made, and originals can be found in antique stores and in online auctions such as eBay for about $100-150. There are nice replicas being made today that have wide hoods making them better than the antiques for viewing with modern glasses. They cost under $40. Order them from Reel 3-D Enterprises. If you have a Holmes viewer, you can print the images on the net, cut them out, and view them. Lorgnette Viewers. The best way to view stereo pairs on a this website, on any computer, or in books, is with a handheld "lorgnette" viewer. Alan Lewis builds the best lorgnettes with glass lenses (left). Plastic lorgnettes (right) work remarkably well and cost only about $2-3 at Reel 3-D Enterprises and from 3dStero.com. To view the stereo pair images on this site with a lorgnette, begin by setting your monitor to display the image of the birdcage below so it is about 6-7" wide. If you wear glasses you can leave them on. Just rest the viewer on your nose parallel to the monitor and focus by leaning forward or back. Start at about 10" from the monitor. Cross-eyed free viewing is a technique that lets you see stereo without a special viewer, but it takes a little practice because it involves crossing your eyes slightly. For it to work, the image must be prepared with the left and right images reversed, which I have done with the image above by an artist named Kroll. Here's how to do it. Level your head parallel with the image, about 10" away, and with your eyes at the same height as the image. Place your finger tip in the middle of the two images along the bottom edge. Stare at your finger and move it slowly towards your nose. You should see three images, not two. Concentrate on the middle one and you will see the the bird in the cage. If you experience eyestrain or headaches, take a break. Memorize the feeling in your eye muscles. When you can sustain the effect after lowering your hand, you are ready to try it without. Anaglyphs. If you print one image in blue and the other in red on top of it, with red and blue glasses the eye perceives depth. Anaglyph comic books and movies were popular in the 1950s, and anaglyph photos are still produced by artists although the medium limits the fidelity of colors in color photographs. Anaglyphs enjoyed a resurgence in popularity recently when, on July 4, 1997, Pathfinder landed on Mars and began transmitting color anaglyphs. The Jet Propulsion Lab (JPL) posted pictures of the six-wheeled Sojurner trundling around in the dust visiting rocks named Barnacle Bill and Scooby Doo. Many are still on the JPL website. Anaglyphs are also used in electronmicrographs, Xrays, and aerial cartography. You probably have a pair of cardboard mounted anaglyph glasses around the house. If not, you can buy nice ones mounted in plastic sunglass-type frames for about $10 at one of the suppliers on our "links" page. View-Master. Named as one of the top 50 toys of the 20th Century, View-Masters made their way into the homes of practically every baby boomer. These round reels with seven small slide pairs were my first glimpse of stereography, and transported millions like me to beautiful and exotic places such as the redwood forests and the Taj Mahal. Invented by William B. Gruber in 1938, the View-Master system was introduced at the New York World's Fair in 1939. Above is a black Model B made from bakelite, used in WWII by combat pilots to study the profiles and "cones of fire" of enemy aircraft. View-Masters are still made, and the newer models are pretty good. They can be found in toy stores for under $10. There are several serious photographers still working in the medium. Among the best are architectural photographers Michael Kaplan and Gregory Terry. Tru-View. The Tru-View system was invented in 1931 and made its first big splash at the "Century of Progress" Chicago World's Fair in 1933 where it was a big hit. 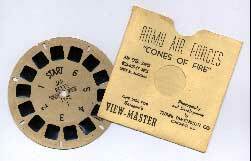 The first models used black and white 35 mm film strips, and later models used a card with seven stereo pairs. At first they were mostly travel photos, Hollywood, and even a risque topic or two, but before long they branched into fairy tales and cartoons, eventually licensing the rights to use Disney characters. Slides. Many aficionados think the best stereo images are slides viewed through binocular-like viewers. At left are two simple "steal the light" viewers that you hold up to a lamp, one for conventional slide pairs, and the other for Stereo Realist slide pairs. Variations on the theme sell for $3-15. Other viewers come with first-rate optics and quartz lights and can sell for hundreds of dollars. Realist made several models, and the Realist Red Button on the right is highly prized and sells for a premium in online auctions. Realist viewers were even used in the 1950s by New York's famous Keen's Chop House to show diners stereo pictures of the meals! The manager called it the "Viand Visualizer." View Magic. These viewers (left) come in two flavors, side-by-side and upper-and-lower. With the aid of mirrors, they allow you to view stereo pairs printed by conventional drugstore printers. Books. Some books come with built-in viewers as does this Mark Blum book (right).